The Hermitage is situated away from all the city noise. It is a great place for meditating or finding a peace. Saint Francis Assisi used this place for praying in the thirteenth-century. For first few years, the only structure here was the small twelfth-century oratory. It slowly started expanding as more and more people started joining him. This quiet, beautiful setting is perfect for those who want to escape from the city buzz. Come here and spend a couple of hours in a tranquil environment. Create a customized plan for your visit using the Assisi trip planner. You can use ready templates or start from scratch for the same. You can enjoy a comfortable stay in the city by booking the best hotels in Assisi like Hotel Roma, Hotel Ideale, Hotel Porta Nuova and Hotel Umbra. Curated Assisi vacation packages await! Book the best ones and start turning your dream into reality.Discover various ways for how to reach Assisi and complete the booking by choosing your mode of transport. Love this? Explore the entire list of places to visit in Assisi before you plan your trip. Fancy a good night's sleep after a tiring day? 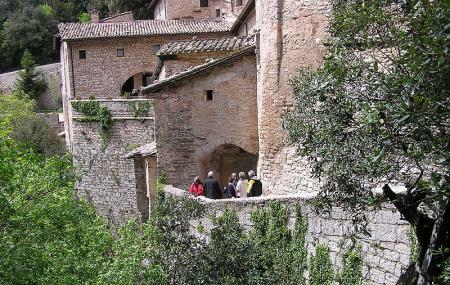 Check out where to stay in Assisi and book an accommodation of your choice. How popular is Eremo Delle Carceri? It is a mystical peaceful place high up the mountain in the middle of a forest. It is the place where St Francis of Assisi used to come to pray. The place is surrounded by peaceful pathways amongst the nature. The building is very old with chapels and shrines, the ideal place for the religious and non to meditate and pray in silence. Worth a visit. Better to arrive by car. If you are intrepid and healthy you can walk it up there....4km uphill. It can be very cold so dress appropriately. This is a place of quiet reflection. We walked from St. Rufinios in Assisi to here. 3 mi walk and 1,200 ft up. The gift shop has snacks and coffee bar. Beautiful landscape with birds singing everywhere. Paths were well maintained. It is really a holy place to visit! Un luogo veramente santo! I’ve stoped my mind today in this place. Great spiritual experience in my life. Love being there. Go to see and come back better by nature.